Adam over at Slice recently reported about a month old pizza joint in Williamsburg. Best Pizza is the name of the place. It took over the space to what used to be The Brooklyn Star, sadly I have never been to The Brooklyn Star. But only couple days of reading about it from Adam I made my way out to Williamsburg for a slice or 3. 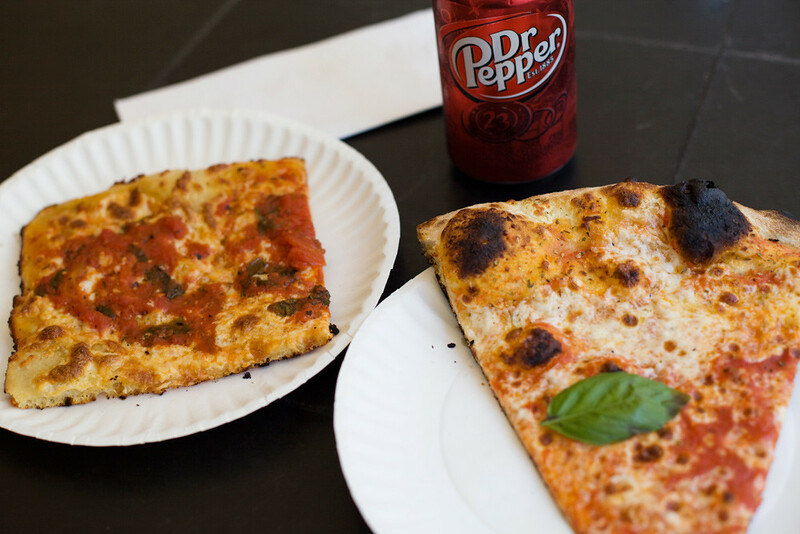 Best Pizza is located on 33 Havemeyer St which is only few blocks from the Metropolitan stop on the G train, easy! I got there right when they opened which was 2pm. I guess they didn’t expect people to walk in right at 2pm because I had to wait a bit for them to make the pizzas. Finally they had a plain pie and a grandma pie ready, so I got a slice of each. I made sure I got the corner slice from the grandma pie. I’m not very good at describing the different components of what make a great pizza but this was great pizza. The plain slice was super thin yet still has the good chewiness of an awesome crust. The grandma slice was amazing as well. Right before each bite I can smell something I guess I can call it umami…whatever umami is from the grandma slice. Or maybe it was the anchovies. Anyways everytime the grandma slice got close to my nose and I smell it, it just made me want to take a BIG bite from it. So good. Well I couldn’t leave the place without trying the white pie. Everytime I see a white pie I think that I have to have a slice because I love white pie but usually after 2-3 bites I freakin regret it. It’s just way too heavy. But from what Adam wrote about the white pie having the perfect amount of ricotta, I just had to try it even though I was full. The white pie, wow just wow. 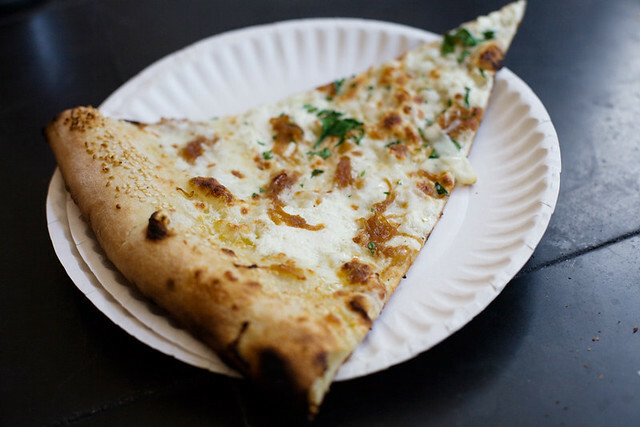 Light on the ricotta, topped with caramelized onions and sesame on the crust. Wow. The caramelized onions REALLY made this slice gooood and I wonder why don’t more places put sesames on the crust, it’s totally awesome! Also a BIG PLUS for having Dr.Pepper! I will back for the pickled veg topping, I promise.